The NDA has lifted on AMD's Vishera FX-8350 CPU. I wonder how the power consumption was when overclocked...5+ GHz and that voltage has got to be toasty! I was hoping the single-threaded performance would go up to at least Phenom II level though. Gonna read this later though. 5+GHz tell me its all cores now. I meant in terms of power consumption and heat output. 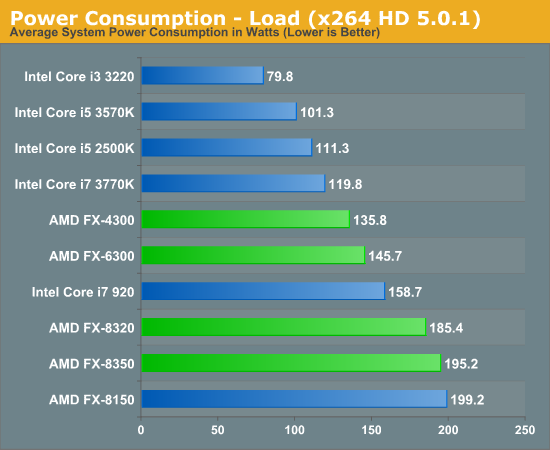 It appears that OC power consumption is down by 15-18% with the 8350. So basically it's still sky-high compared to anything else on the market? That's disappointing to say the least. Its the only comsumption benchmark I remember from the top of my head.